Looking for a New Genesis G90 in your area? CarGurus has 35 nationwide Genesis G90 dealers with 1,520 new car listings. Genesis may be an unfamiliar make, but its roots are well-known. The Hyundai conglomerate first started using the nameplate on its Hyundai Genesis sedan in 2009. In 2017, Hyundai launched Genesis as a luxury brand. For its first sedan, Hyundai rebadged its Genesis model to create the Genesis G80. That year also saw the introduction of the G90, the first exclusive model for Genesis. In the 2018 model, Genesis makes only minor changes to the G90. A full-sized rear-wheel drive (RWD) luxury sedan starting at $68,350, the G90 competes in a market segment shifting toward larger SUVs. Consumers shopping for a sedan often favor better-known automakers, so Genesis has focused on building a remarkable car with extensive standard features at a competitive price. The 2018 Genesis G90 features a long wheelbase and understated styling. Long headlights with slanted signatures flank the G90’s hexagonal grille. A long black aperture with additional LEDs and tasteful chrome accents frame the lower fascia. The sides employ subtle creases and surfacing, and the stalk-mounted mirrors keep the side window profile clean. The trunk lid is nearly 90 degrees and surrounded by vertical tail lamps that echo the lighting signatures on the front. The G90’s interior is equally opulent. There are great big expanses of wood across the dashboard, door panels, and seatbacks, and there are satin-silver accents and buttons throughout. A giant, high-resolution 12.3-inch infotainment screen sits at eye level in the center of the dashboard. There’s Nappa leather upholstery and seating controls for rear occupants in both the two or three-person configuration. Contrast piping and rich colors will leave no doubt as to this luxury sedan’s stature. Like the exterior, the interior’s overall design is elegant and inviting. In particular, Genesis paid a high amount of attention to refinement, tactility, and ergonomics, letting passengers relax and enjoy the ride. The G90 is available with two engines. The base trim engine is a 3.3-liter twin-turbocharged 6-cylinder with 365 horsepower and 376 pound-feet of torque. Buyers can opt for the 5.0 Ultimate trim with a 5.0-liter 8-cylinder with 420 hp and 383 lb-ft of torque. Both engines are mated to an 8-speed automatic transmission and rear-wheel-drive (RWD) platform with the Genesis intelligent HTRAC all-wheel-drive (AWD) system available. Every G90 comes with four selectable drive modes, ECO, SMART, SPORT, and INDIVIDUAL. Each mode feeds distinct parameters to the engine, adaptive suspension, transmission, steering, and stability control. Reviewers praise the G90’s driving dynamics, that offer plenty of hustle for a flagship luxury sedans. On the feature set, the G90 is more than competitive. Self-closing doors are standard—if any door isn’t completely shut, the G90 will close it for you. In addition to that, navigation, a 22-way powered driver’s seat, a hands-free powered trunk lid, a powered parking brake with an auto hold feature, heated rear seats, a color heads-up display, a Qi wireless charging pad, and a 17-speaker Lexicon audio setup are all standard. The available Ultimate package for the 5.0-liter is aimed at further pampering rear occupants with ventilation, memory, and power movement for the outboard seats, vanity mirrors, and an entertainment system with dual 10.3-inch displays. In regards to safety, the G90 benefits from being a large heavy sedan, but that didn’t limit Genesis from including an array of modern features. Every G90 comes with nine airbags: dual front units, front and rear side units, a driver’s knee unit, and curtain units for all outboard occupants. In addition, there’s a complete suite of standard driving aids, like front and rear parking sensors, automatic emergency braking with pedestrian detection, lane keep assist, lane change assist, blind-spot monitoring, rear cross-traffic alert, driver attention alert, adaptive cruise control, and a full surround-view camera system. The Insurance Institute of Highway Safety (IIHS) tested the G90, and it received the highest marks in all crash categories, earning the title of a Top Safety Pick +. 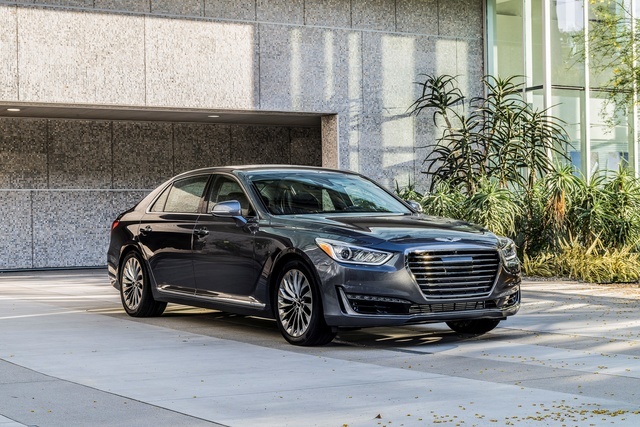 Genesis shows the market that they can create a world-class luxury sedan with the G90. Fit-and-finish are top-notch, features are modern, and comfort is abundant. It may lack some of the drama of European competitors, but the G90 undercuts those vehicles by five figures and whispers opulence when others scream it. Anyone looking for a competent, handsome large luxury sedan would be well served by the G90. What's your take on the 2018 Genesis G90? 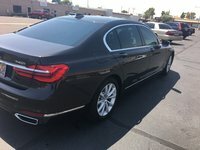 Users ranked 2018 Genesis G90 against other cars which they drove/owned. Each ranking was based on 9 categories. Here is the summary of top rankings. Have you driven a 2018 Genesis G90? Enter your zip to see incentives for a new G90 in your area.